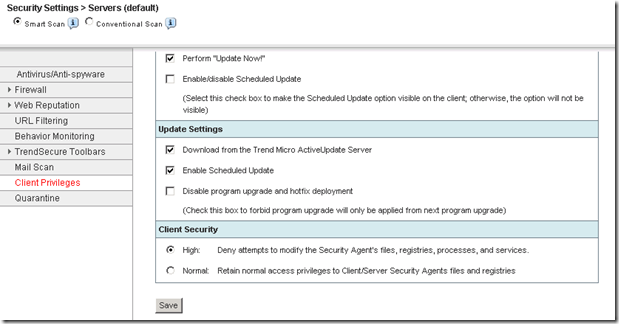 Why can I not stop my Trend Client Server Security Agent services? If you have tried to stop some of the Trend Micro Services before and found that the stop option is greyed out like below, you might be concerned that things are not right with your server. In fact – they are very right indeed. I normally recommend stopping all Antivirus Services before installing major updates like service packs for Windows or Exchange Server and so on. Trend Micro WFBS has a feature to increase the security on it’s services so that not even an administrator can stop them. This feature is designed to help prevent malicious programs from terminating Trends ability to protect your system from infection. In order to disable this feature temporarily, you need to login to the WFBS Security Server console, navigate to the Security Settings for that group – this is my server so it’s in the Servers (Default) group. You will see in the screen shot below, the Client Security setting is set to High. Change this to Normal and select Save. Now – on the Server computer itself, right click on the Trend CSA icon in the taskbar and select Update Now. Give it a minute to grab the latest configuration from the Trend Security Server and then you will be able to right stop services again. See below. 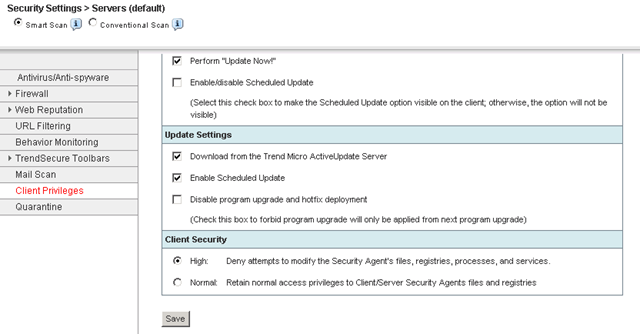 Make sure that after you have done your maintenance, that you go back into the Trend Security Server Console and change the setting back to High. The installer must have shut down some IIS or other services necessary to login to the Trend Console, as I now have no access to it and can’t stop Trend! Would be good if anyone know a CMD line way or other of achieving the same reduction in security to allow me to stop the services? Many thanks! It a very good web site. Hello there, excellent web page you’ve got here. These options are both well suited to phone system buyers guide business uses. services, you can either use a VOIP system is completely different. Show World as a professional Seaarch Engine Optimization company. also master some technical strategies to draw maximum traffic to a website. of what sites should rank where in tterms of certain keywords or search phrases. für die Linklaters-Vorgängerkanzlei Oppenhoff & Rädler aktiv. We already accept in most ordinary situations that our beliefs may, at some future date, be shown to have been mistaken; nor do we think there?? ?s anything contradictory in having a belief now but opposing that very belief at some future point after it?? ?s been revealed to be false, and so modified.